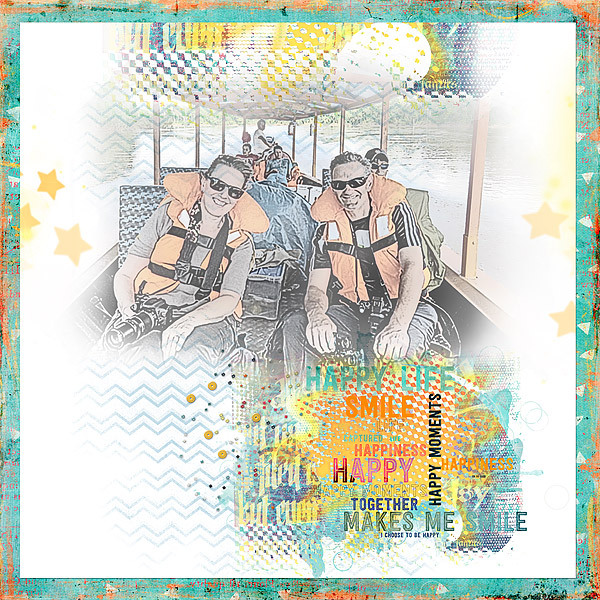 Hi – Jane here today with a page using parts of the beautiful April Mini O Kit – Happy Life created by NBK Designs (elements, masks, word art, paint and toolbox) and Joyful Heart Designs (multiple paper packages) available at OScraps – http://www.oscraps.com/shop/4th-Friday-Mini-O-s/ . The new Brush Toolset 9 had some great brushes that co-ordinated perfectly with the elements in the kit. My page today features a photo taken on our trip last year to Peru. We spent a week in the Manu Reserve, traveling down river by boat and camping at various (fairly primitive) lodges along the way. It really was a wonderful way to see the scenery, some of the wildlife and take lots of photographs! !